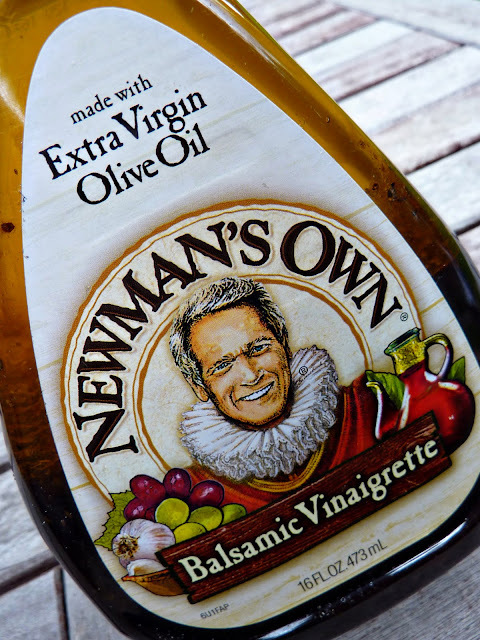 When the craving for a delicious salad dressing strikes, I always turn to Newman's Own Balsamic Vinaigrette. It is fabulous on nearly every type of salad I can dream up. Balsamic Glazed Steak Salad, Chicken Salad Salad, Tuna Salad Salad, Egg Salad Salad... you get the idea. I put my trust in this product because it is gluten, dairy and corn free! This is a rarity among prepared salad dressings. Most dressings on the grocery market shelves these days contain high fructose corn syrup. The absence of that strange oddity known as hfcs in this dressing makes me want to do backflips. Hooray for Newman's Own! And besides, the Newman's Own Foundation donates all profits to charity. Since 1982, Over $300 million has been given to thousands of charities. Hooray! This is not a paid advertisement. I like Paul Newman in Cool Hand Luke. I like Paul Newman in Road to Perdition. I like Paul Newman all up on my salad. I like Paul Newman too and I love his salad dressings. If I don't make my own I always use one of his!